Mississippi has a crime rate 10 percent above the national average, making careers in criminal justice in-demand in the state. Those interested in attending criminal justice school in Mississippi can transition into industries such as criminal investigation and prosecution, correctional facility, judicial and legal work or even wildlife and natural resources law enforcement. 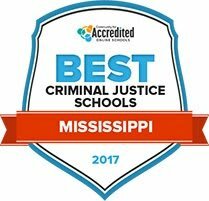 This page offers information about Mississippi’s best criminal justice schools, as well as state-specific employment, salary and job growth resources for current or prospective students, and anyone interested in exploring a degree in criminal justice. After Criminal Justice School in Mississippi: What's Next? With a variety of program options, specializations and criminal justice schools spread across Mississippi, the search for the perfect school can be difficult. The list below provides an analysis of which schools offer the best overall value for criminal justice students. Each criminal justice school is scored and ranked by features like tuition cost, acceptance rates and financial aid availability. These variables can help college-bound students efficiently assess Mississippi’s best criminal justice programs. With day, evening, weekend and online classes, Itawamba Community College offers two-year associate degrees, university transfer degrees, and more than 30 career training programs. Campuses are available in Belden, Fulton, and Tupelo. A high percentage of all students receive some form of financial aid. Graduation requirements for associate degrees include up to 37 hours that satisfy state general education requirements and 30 hours of studies in the major field. The associate degree in criminal justice program trains students for entry roles administration of justice professions for transfers to four-year CJ programs at five participating Mississippi institutions. Holmes Community College (originally Holmes County Agricultural High School) was founded on 42 acres in Goodman in 1911. Today HCC serves students from the Goodman campus as well as at campuses in Ridgeland, Grenada, Kosciusko, and Yazoo City. Its associate degree and certificate programs are accredited by the Southern Association of Colleges and Schools Commission on Colleges. The 52-hour associate degree in criminal justice prepares students for transfer to four-year CJ programs while allowing curriculum in corrections, behavioral science, police administration, and juvenile justice. Students also complete 3 hours in criminal justice electives. East Mississippi Community College was established in 1927 in Scooba. Today it serves 4,000 students and maintains its Golden Triangle campus in Mayhew. EMCC also offers classes at the NAS Meridian Extension and Columbus Air Force Base extension. The Social Science & Business Division administers the criminal justice academic program leading to a two-year associate degree. The program can stand alone as a career-preparation curriculum or include general education coursework to facilitate transfers to four-year institutions. Courses include studies in homeland security, forensic sciences, law enforcement administration, and law enforcement policy. The main Wesson campus of Copiah-Lincoln Community College is situated about an hour south of the capital in Jackson and two hours from New Orleans. Its more than 2,800 students can choose among technical and career programs, or enroll in an associate degree program that prepares them for transfers to baccalaureate degree institutions. The 62-hour associate degree in criminal justice satisfies Louisiana core studies requirements as well as offers students 26 hours of electives in their criminal justice curriculum. Students planning to transfer to a four-year CJ program are encouraged to identify their preferred bachelor program prior to enrolling in the Lincoln College CJ major. Hinds Community College, the largest community college in Mississippi, has served students from more than 70 of the state's counties since it was founded in 1917. Today it provides post-secondary education to 32,000 students, offering a two-year associate degree to prepare graduates for college transfer, or more than 80 career and technical programs. All coursework and training in the criminal justice program is held at the Raymond campus. The 64-unit CJ program culminates in the award of an associate degree in applied science. CJ students can focus on nine offered courses that focus on a specific field in policing, criminology, corrections and juvenile justice. Mississippi Valley State University's criminal justice program introduces the foundations of the criminal justice system: law enforcement, courts and corrections. Curriculum covers crime prevention strategies, criminal law, and juvenile justice systems, as well as private and industrial security. Students also complete a two to three month internship at a criminal justice agency. The school recommends that the internship be completed during summer months, but a fall or spring internship is also accepted. Current students and alumni can access the school's career services, which offer on-campus interviews and access to job, internship, and scholarship postings. Students in the University of Southern Mississippi's criminal justice program complete coursework in field-specific topics such as modern corrections and criminal procedures, as well as more general fields like management, politics, and psychology. Curriculum is centered on the importance of clear communication, critical thinking, and rational analysis as they are applied to traditional criminal justice professions. Related degree programs allow learners to specialize their studies in juvenile justice or forensics. Students can pursue study abroad experiences through the criminal justice department, with destinations in Europe, Canada, and the Caribbean. Several scholarships specific to criminal justice students are available. At the University of Mississippi, students can enter the criminal justice program as a traditional four-year major or as a transfer from a community college. The program combines classroom learning and an internship, and students can choose to focus in corrections, homeland security, or law enforcement. Many resources are in place at Ole Miss to support student success: a writing center, where students can get free writing consultations online or in-person; an information technology center that provides training and technical support; and a Center for Student Success and First-Year Experience that guides learners with academic advising and initiatives to support first-year students. Mississippi College's administration of justice program can help prepare graduates for careers in law enforcement, homeland security, emergency management, loss prevention, or security management. Curriculum focuses on five areas of emphasis: police process, corrections process, criminology, judicial process, and homeland security. Students typically complete nine semester hours of study in each of these areas, as well as additional study in foundational criminal justice topics and electives. The school's Criminal Justice Club provides a career forum where students can hear from guest speakers representing federal, state, and local criminal justice agencies. Jackson State University offers a bachelor's degree in criminal justice, as well as a master's degree in criminology and justice services. The school offers support to its criminal justice students in numerous ways. Financial support comes in the form of academic, diversity, and development scholarships. Freshman, sophomore, and transfer students are also supported through the Academic Advisement Center, which helps learners to create a path towards graduation that will help them meet personal and professional goals. The career services center caters to students at any place in their academic career, counseling them on career choices, graduate school options, and employment opportunities. Each college and university offers their own set of specializations within their criminal justice program. To learn more about all the options for criminal justice students in Mississippi search the complete program list below. Students may narrow results by degree levels, tuition rates and more, with each criminal justice school listing its available specialized concentrations. A degree in criminal justice may lead to many different careers. Take a look at some of the most common occupations for criminal justice school grads in Mississippi below. Before choosing a specialization within criminal justice, college-bound students can get a feel for what each profession looks like in the state of Mississippi, including average salaries and the level of education required for each profession. When choosing a criminal justice school in Mississippi it may also be important to consider the legal and protective service career options available in the state. With crime rates 10 percent higher than the national average, many criminal justice oriented fields show higher than average job growth projections. Compare Mississippi’s numbers on the graphs below and learn about which degree each specialized position within criminal justice requires, from Doctorate to Associate. Before enrolling in criminal justice school, students may want to have a better understanding of the most employable areas in the state. Michigan has many large-population cities with criminal justice career opportunities, examples mapped below. Details on common industry careers and the largest employment areas in the state of Michigan are included-scroll over the map to learn about each region. The Department of Revenue provides information on Mississippi’s taxes, registering businesses, online tax forms and various laws for individuals and businesses working in the state. This department works to ensure fair and ethical banking in Mississippi through regular examinations of businesses handling finances such as pawn brokers and motor vehicle sales companies. The Secretary of State is in charge of business regulation and enforcement as well as business services. This website provides information on forming a business in Mississippi, from registering the business to the state rules for businesses and employers. This organization helps small businesses succeed by providing loans, counseling and training sessions and resources for legal and regulatory compliance for business owners. A research organization that analyzes and advocates for humane, effective approaches to criminal justice, with a special focus on mass incarceration and immigration systems issues. This is the Mississippi chapter of the national non-profit. The MDoC provides information on correctional institutions in Mississippi, covering topics such as inmate statistics, administration and finance, laws and regulations and professional development. Employment requirements can also be found here. This website details information for juvenile legal and regulatory compliance. They release data on juvenile institutions and how volunteers and criminal justice professionals can improve the juvenile justice system in Mississippi. This office works closely with the court system to help rehabilitate and reintegrate convicted individuals back into Mississippi communities. Their website provides necessary probation forms, information on programs and services and employment and internship opportunities. Jobs available in Mississippi’s court system. The website also has information on Mississippi courts themselves. A links page to information on Mississippi’s court system, including various courts and facilities and a portal to employment opportunities. This division of the Department of Justice serves the community by providing data and information on employment standards and guidelines, laws and regulations, services, publications and initiatives. This website makes court related information accessible to Mississippi citizens. They update their page with legal information such as forms, legal policies and regulations, briefs, reports and employment opportunities. Dealing with overall criminal justice reform, civil rights and juvenile justice advocacy, the SPLC is a team of civil rights lawyers and staffers who work to promote equality and justice for all. The group has an office in Mississippi, and history, career information and details on initiatives can be found here. The American Civil Liberties Union of Mississippi works with courts and the communities to ensure fairness and equality for civil rights cases. Their website includes information on criminal justice reformation, freedom and equality standards, and other resources to help protect Mississippians. The Innocence Project represents clients who claim to have been wrongly convicted in the Mississippi legal system. This website provides information on their processes, assistance and multiple cases of wrongful conviction. The Mississippi branch of this association supports lawyers by detailing their initiatives, regulations, and free legal assistance programs in Mississippi. This organization comprised of attorneys works with civil justice cases to ensure justice and accountability. Individuals can access information on attorney legal practices, informative conferences and events and legal publications and databases. This coalition of police chiefs has resources on trainings, conferences, testing, current legal issues, and links to helpful resources including standards and policy manuals, professional associations and certification programs. A website that is the hub for the various divisions of Mississippi law enforcement and criminal investigation. There are links to information on motor vehicle safety, firearm data and permits, and other divisions that handle cases of public safety. This association is a membership organization for private investigators in Mississippi where they can discuss and network with other professionals and find information on investigative work such as infidelity, fraud, missing persons and background investigations. This membership organization trains and educates Mississippi law enforcement officers and agencies in order to build officer professionalism and proficiency. This website provides information on training, memberships, events and supported legislation. The Mississippi Sheriffs’ Association provides law enforcement training to help with communication management, law compliance and other professional development opportunities. Mississippi employs law enforcement professionals to enforce federal and state marine laws that range from boating safety to protection of wetlands in the state. This website provides information on issues such as the current state of Mississippi’s coast, coastal resources and marine fisheries data and technology. The National Park Service educates rangers, volunteers and Mississippi citizens about national parks through in-park information and online resources including park statistics and news. This website includes information for environmental law enforcement about rules and regulations designed to maintain safety and preservation, resource management and partnerships. This department provides useful information such as data, management and training opportunities, campaigns, programs, and other public resources on Mississippi’s environment.